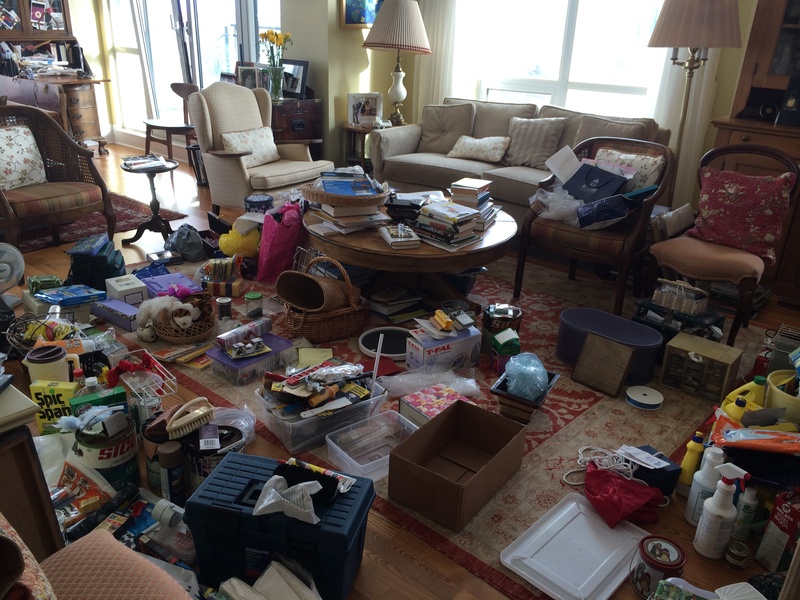 Are you considering hiring an organizer for your next project or move? 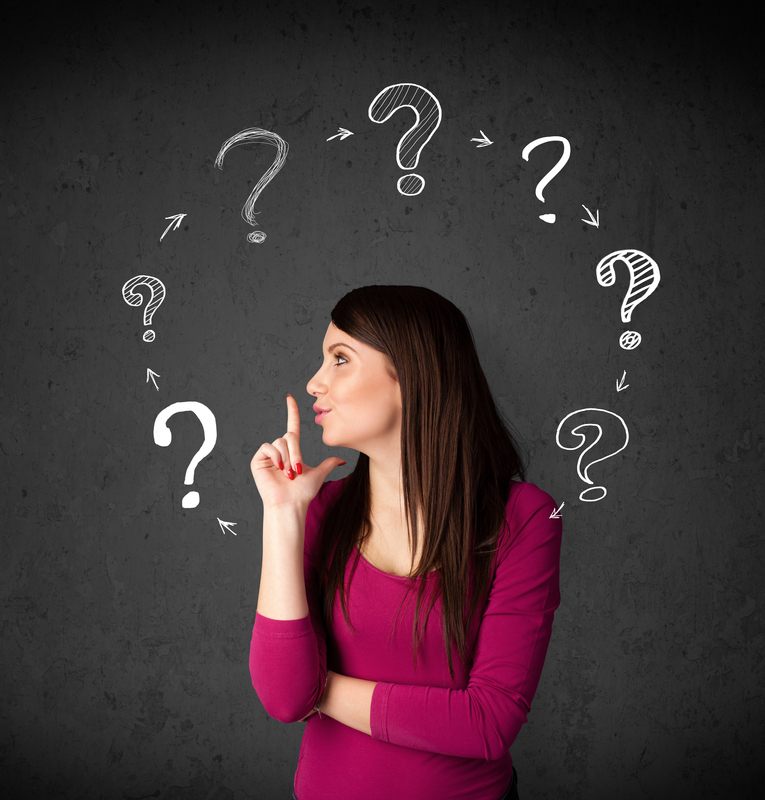 Here are 10 questions to ask before you hire an organizer. Over the next few weeks I will explore each one a little more with additional thoughts, tips and tricks to hiring an organizer that works for your style and your needs.What kind of projects do you typically work on? How long have you been organizing? Are they just starting out or do they have years of professional expertise? Do you have past or current clients I can contact as a reference? There is no better information than from someone who has worked with them. Can you describe your organizing process? The process will help you understand what to expect in a session. Different project are priced differently. Make sure their structure works for you. Do they charge? How far in advance do you need to plan? Describe your typical client like? Helping you gain an even better understanding of expertise and interests. Just incase, you never know what might happen. 10. What professional associations or certifications do you hold? Being active in the profession and on top of trends is important. Plastic wrap between the lid and the bottle because is there anything worse than finding a shampoo spill on your first day of vacation? It’s that time of year for me again, the annual camping trips! I am so looking forward to heading out with good friends for a weekend filled with questionable hygiene practices, amazing food and lots of lake time. W have decided to bring our six year old along for one of the weekends, we’re going two weekends back to back – should be interesting! 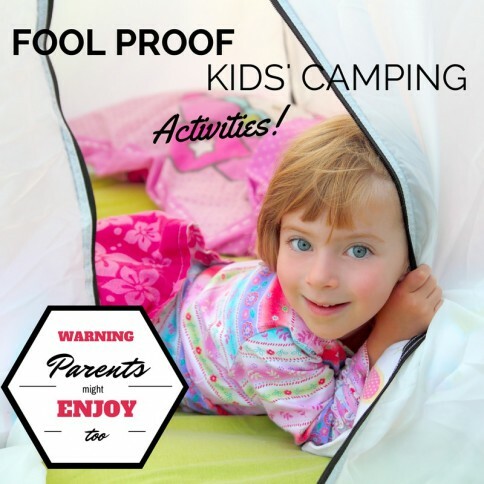 So, this year I thought I would share some ideas I have found to make the camping trip as fun for him as it is for us. I will follow-up in August on what worked and what didn’t or things we made up along the way! One thing for me to think about is activities. There are two sides to my thinking. I want this camping trip to give him an opportunity to unplug and enjoy nature. 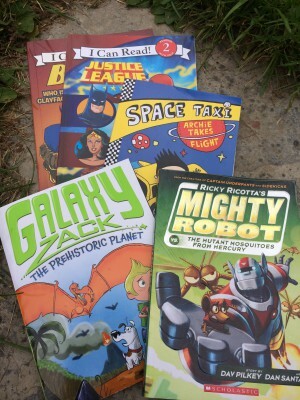 So, if he’s a little bored here and there that’s ok some of my most brilliant moments as a kid came when I was bored. However, I have to be realistic, so I will prepare a few things for him to do over the weekend. Creating a scavenger hunt is high on the list. 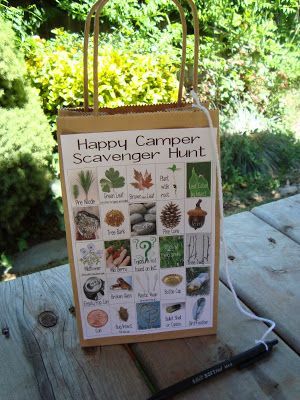 We go for scavenger hunts at our cottage all the time. We call them adventure walks, but they aren’t really all that organized more a haphazard collection of treasures. Creating a list and a fun little sack for collecting will increase the independence of the game and get him exploring. This activity is two fold – painting and then endless hours of hide and seek. 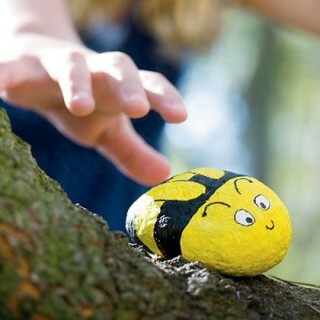 Paint a rock and then hide it around the campsite or a set area of the campground. I like the idea of painting multiple rocks and hiding them. Like a summer egg hunt with rocks… Might sound a little feeble in such a high tech world, but I predict a winner on camping weekend. I love this idea for night-time. Being outside around a campfire at night is so exotic to a kid that hasn’t camped before so I want to give him fun things to do at night too. Cue glow stick water bottle toss. We can reuse water bottles to create a fun nighttime game. 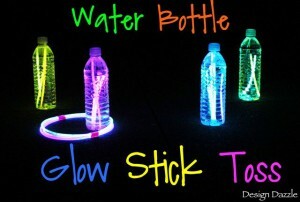 Glow stick water bottle toss tourney anyone? Also, side note, you could use a ball and turn this game into glow stick water bottle bowling, the possibilities are endless! In our family we love card games. My husband and I are Phase 10 masters. We’ve played since basically the day we met. Our son as a result is a bit of a card shark himself. 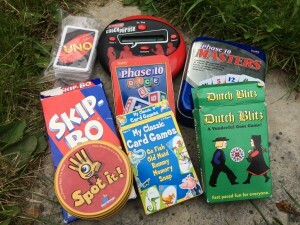 He loves: Uno, Dutch Blitz, Skip-bo and ofcourse Phase 10 as well as the classics go fish, old maid, rummy, snap, spot it etc. We all love the game catch phrase and even my six year old is getting good! I will also bring a bag of books as he is starting to enjoy quiet moments with a book, which sounds pretty great to me. I will also suggest that he pack a bag of items he would like to bring, which will most likely include a sticker book or two and a collection of small action figures or Trashies. Ever heard of a Trashie battle? Me either, he made it up when he was bored one day, bringing me full circle that sometimes your most brilliant ideas come when you are bored! I will report back on what was a hit and what flopped and any fun things we created along the way. Next week I think I’ll share a few snack ideas I’m cooking up for the weekends – adult and kids will love them! Heading out for a vacation this summer? Are you stressing about what to bring? 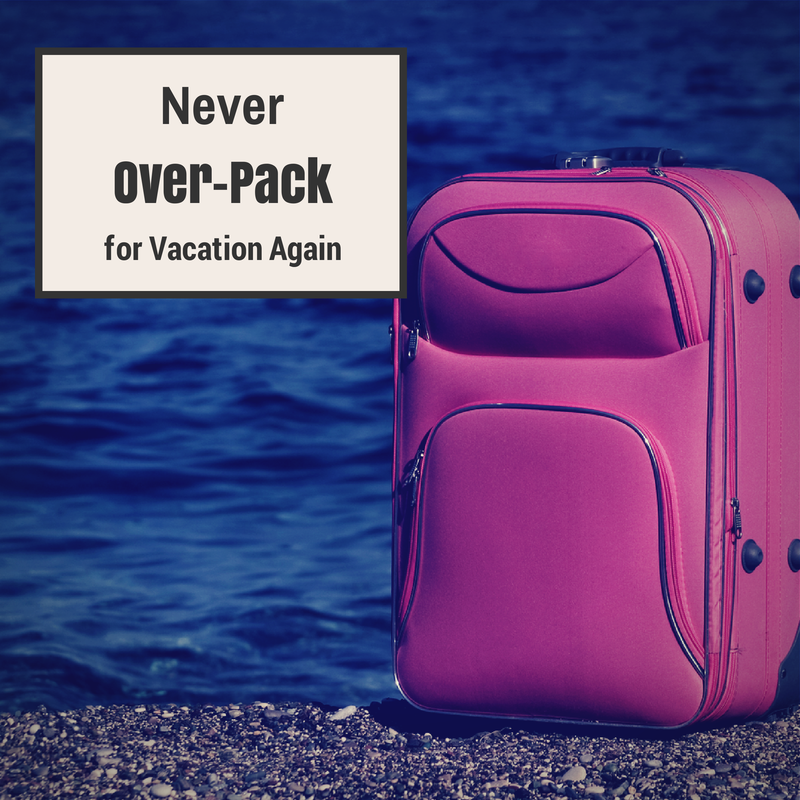 Over-packing is one of the biggest mistakes we make when packing for vacation. Have you ever tried rolling a huge suitcase over cobble stone streets in Italy or bringing way to may clothes on a beach vacation because you realize bathing suits and a few sun dresses do the trick? Time to pair down and get serious about what to bring. Top three things to remember: Be ruthless, Be realistic, Be methodical. I found a few great images that really help you visualize what you need to bring. The first is an example of a one-week “city” vacation: sightseeing, visiting friends and family etc. I like this list because you have a couple staples and then smaller filler pieces to create different looks without a lot of frivolous items. Tip: Pick a color scheme. This one has an underlying theme of pinks and oranges. This will help you focus in on items that work with the palette. This list is similar to the one-week city vacation, but expands to include accessories. Again you want to bring minimal pieces that work with multiple outfits. Tip: Wear bulkier items on the airplane: jeans, sweater/jackets, boots etc. This will save valuable room in your suitcase. Here is a visual for a one-week beach vacation. I like that they geared it toward a carry-on suitcase. I absolutely believe you can pack for a beach vacation in a carry-on. 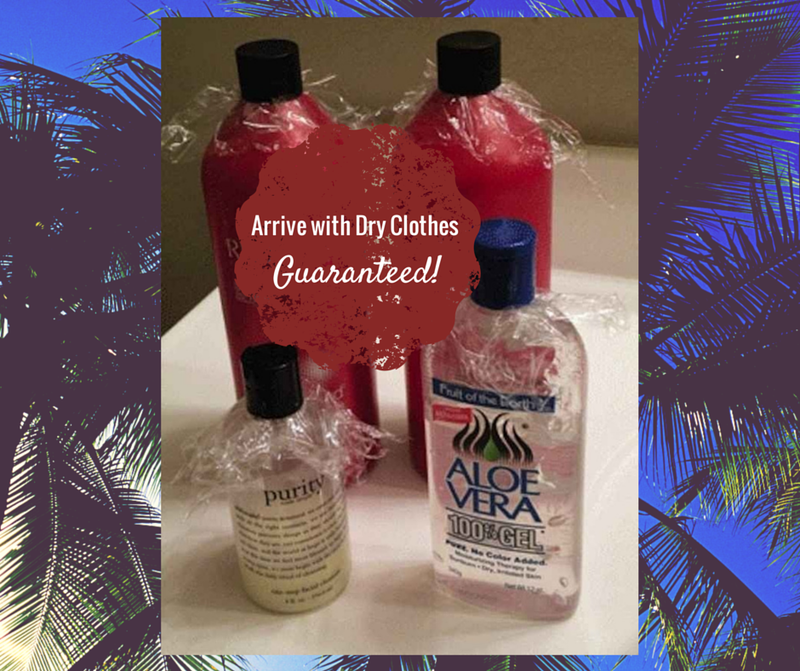 The clothing are lighter and smaller, you don’t have a lot of big shoes to pack, You can use your beach bag as a separate carry-on bag and be ready to hit the beach when you get to the hotel. Tip: Squeeze sunscreen into carryon approved containers. 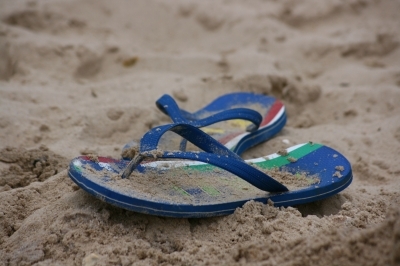 It can be expensive at the resort and you don’t want to burn, that’s the fastest way to ruin a vacation. I hope this helps as you plan for your summer vacations. Keep a little room in that suitcase for item you pick up on your travels, you never know what treasures you might find. My favorite blogs are when I get to share some of my findings with you. 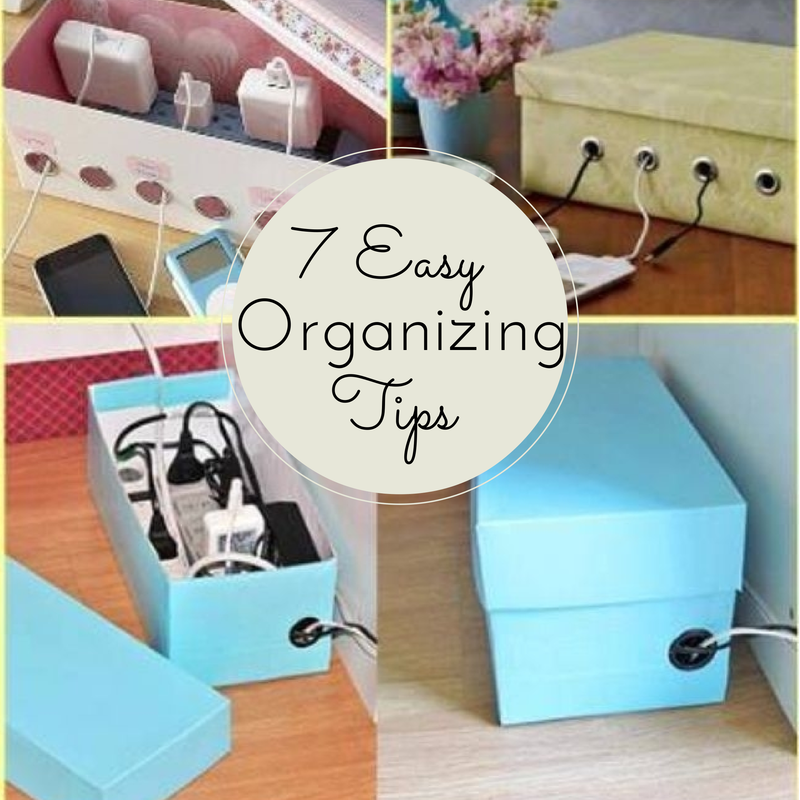 These are just a collection of quick organizing ideas with items you probably have laying around you house right now. No need to spend a dime and you declutter by giving a lifeless piece of stuff a function, bonus! 1. 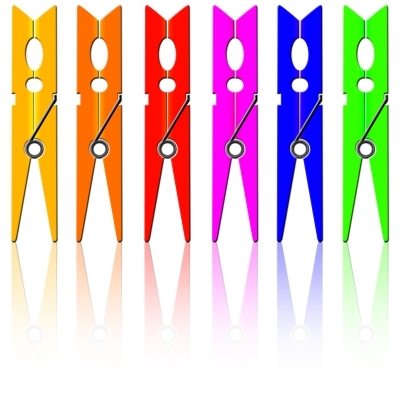 You know the plastic pant hangers you get time to time – well simply break off the clips for instant function. 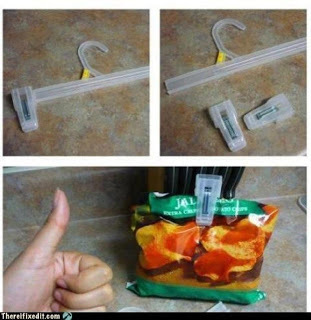 Chip clips, brilliant! 2. 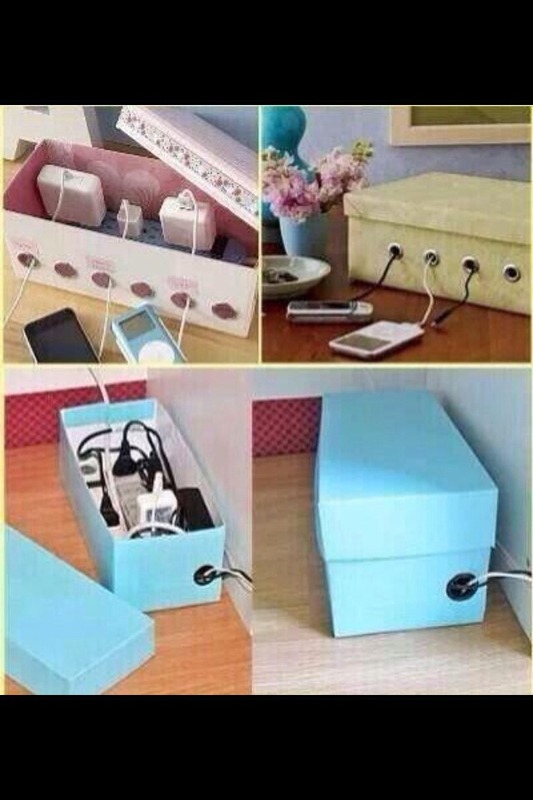 Shoe box charging station – need I say more? All you need is a power strip and possibly some metal grommets to preserve the holes and give it a fancier look, but really a show box and power strip do the job. 3. Metal hangers – I hate metal hangers. Not quite a Joan Crawford, Mommie Dearest way, but, metal hangers are not my favorite. However, this is a fabulous idea to repurpose them in a functional way for your closet. 4. 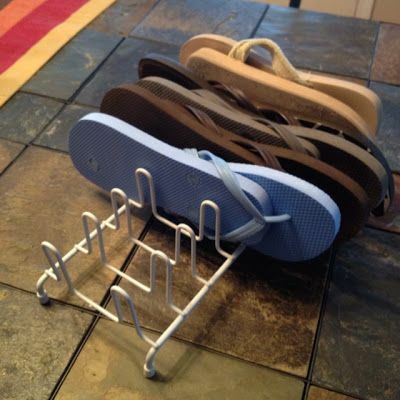 Here’s another great storage idea of flip flops using a plate holder. 5. How about this idea for old garment bags? 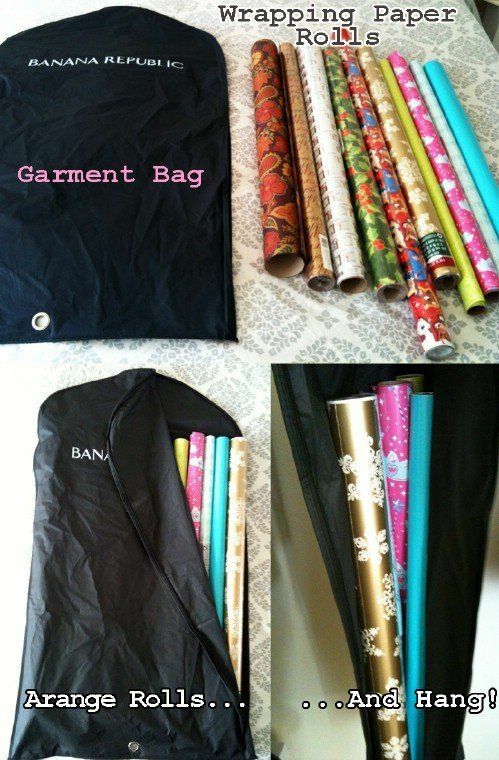 You can repurpose the old garment bag for wrapping paper rolls and hang it all in the closet. Comparable wrapping paper organizers at the store would cost $19.99 and up. Create pockets on the outside for tape, ribbon and gift tags by using a plastic page protector taped on three sides with clear packing tape. You can use this for other large and small crafting items or large, flat school projects you or your child are not ready to part with yet. 6. 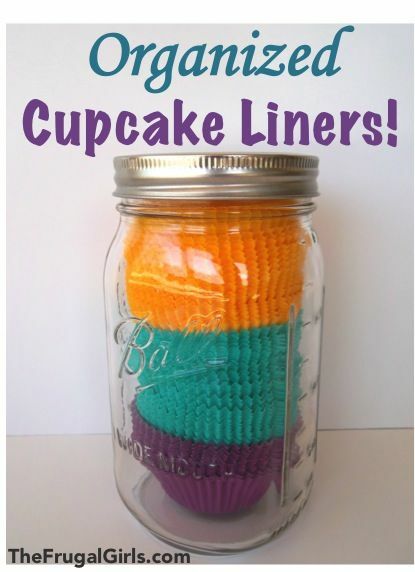 Muffin liners in a mason jar! I personally have more mason jars than I can currently use – I had a bit of a craze for them around my wedding. So, why not repurpose for storage. They also work great for the pantry – storing nuts, baking goods etc. 7. I love opening a Tic-Tac container. Something about the pop it makes when it opens and closes. Keep the lovely sensation going by storing bobby pins in them. 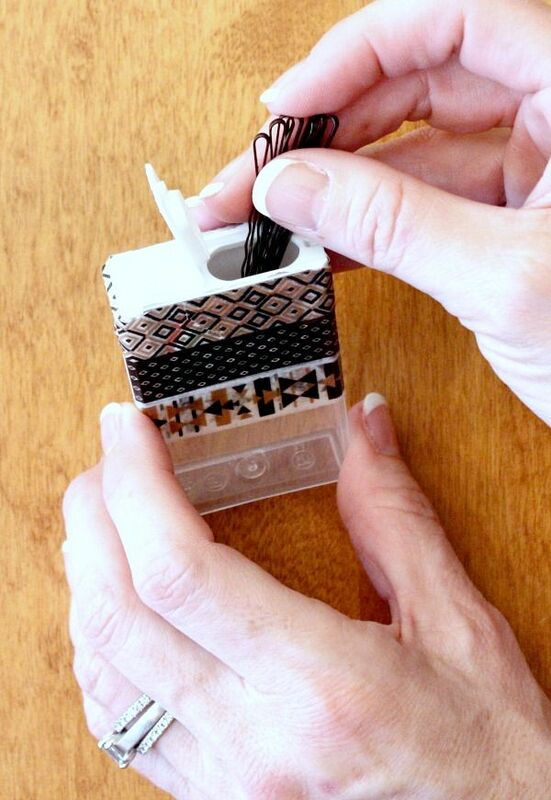 Seriously, I just did this to my bobby pins! You can also decorate the outside anyway you like. I would love to hear about your upcycling projects. Post about them below in the comment section or share on Pinterest. 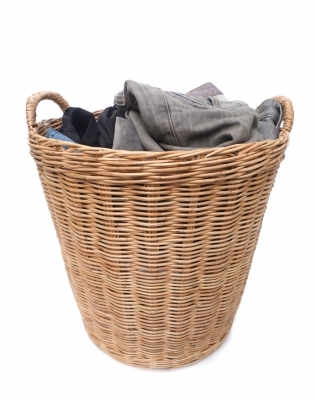 Do you struggle with laundry in your home? Do you find it piling up faster than you know what to do with it? I have a couple tips and tricks to make life easier for you. First, create a schedule. I created a cleaning checklist for a past blog. You can check it out in here . By tackling the domestic chores a little bit everyday, you keep them from building up into overwhelming tasks. The schedule in my home looks like this: All clothing on Sunday and Wednesday. All towels on Tuesday and Saturday and Sheets on Saturday. I know what you’re thinking, that’s four days of laundry a week. However, doing one or two loads a day is a lot more manageable than six loads one day a week. Next, create standard loads. I have four loads that I typically run on clothing days – darks, lights, a non-delicate hang dry load and a hand wash load. This makes it very easy for me to separate what goes into the dryer before everything is soaked, stuck together and hard to distinguish. 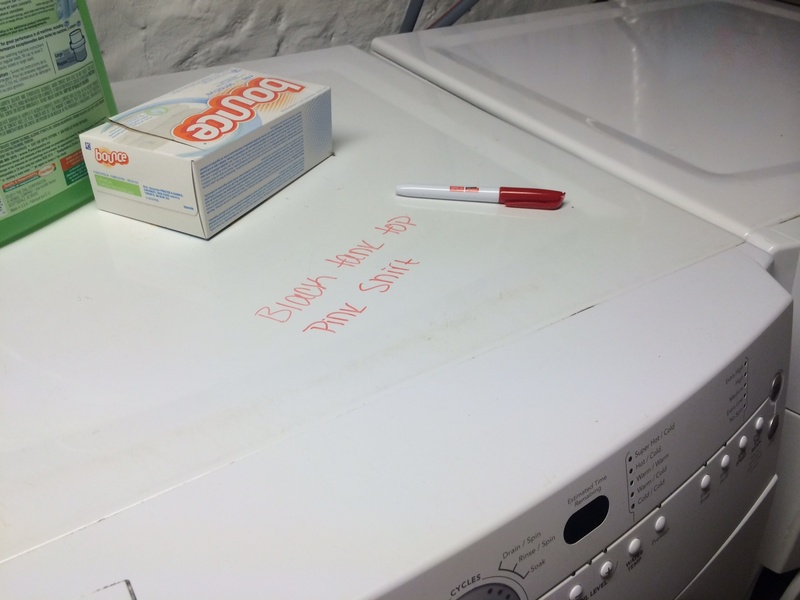 If you don’t have enough items to justify a separate load for hang dry items grab a dry erase marker! What?! 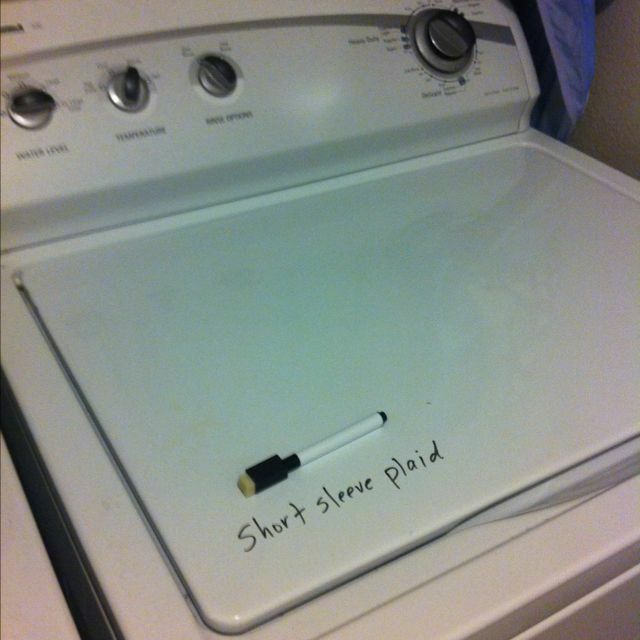 Write with the marker directly on the washer what needs to come out before transferring the rest over. This will save your favorite items from shrinking to oblivion. 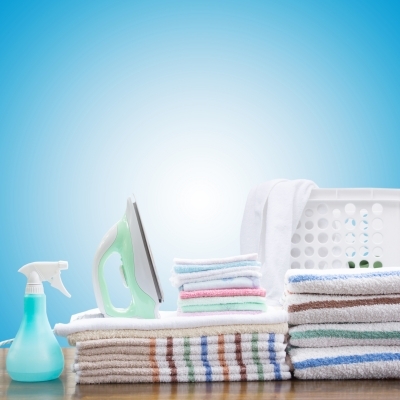 Last, stock your laundry room with the supplies you need to successfully clean your clothing. Obviously you need detergent and fabric softener, if you use it. But think beyond that. What about a drying rack and hangers to address clothing that need to air dry. Next time you upgrade your toothbrush use the old one to scrub out stains. Spray a little stain remover, scrub with the toothbrush and then let it sit. Keep a small container nearby to collect loose change and other odds and ends. Keep a central location for single socks. At the end of the load see if you can match any up. After a month you can clean out the singles and start again. Don’t forget laundry is a fun way to get kids involved in housework. They love to help and this is a very valuable life skill for them to have. Share the love and go start a load of laundry! Don’t Worry it looks worse before it looks better. Here is a truth about organizing. 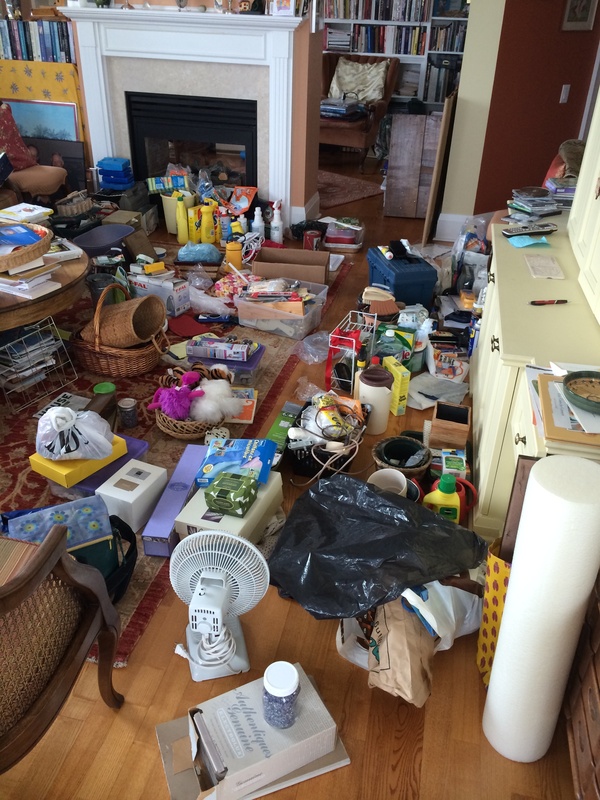 When you are sorting an overcrowded disorganized space it will always look worse before it looks better. I think one of the reasons people stop organizing projects, or never start them, is because we become overwhelmed by the middle stages; when everything is everywhere and we can’t see the light at the end of the tunnel. The trenches of organizing! It’s not where we want to be, we want to be on the other end with amazing systems in place and like items together. So, how can you get there? Go through the process. Sort -> Edit -> Reorganize. Stick with this system and you will come out the other side successful, I promise. This is how we started. 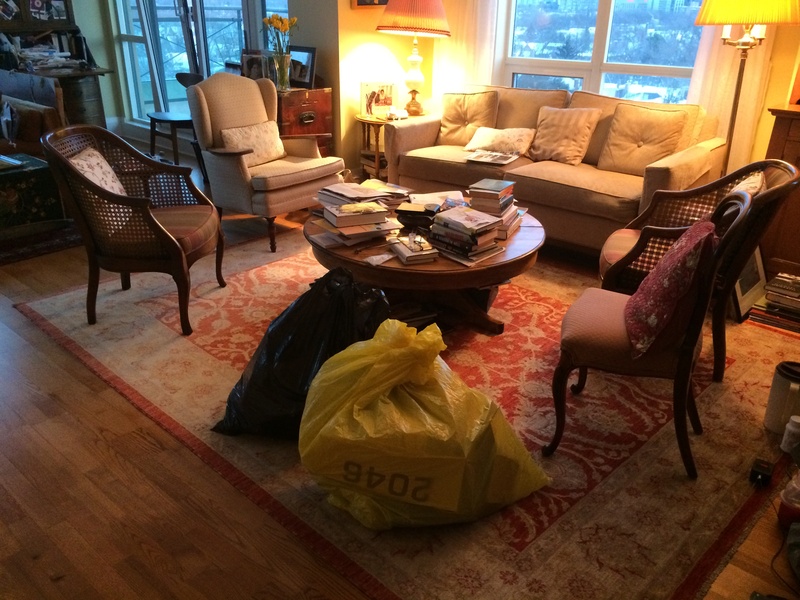 We slowly brought everything out of the closet sorting them into like piles: gardening, hardware and tools, wrapping and ribbon, cleaning supplies, tape, etc. We did this until the closet was empty and the piles were complete. So here we are in the thick of it. 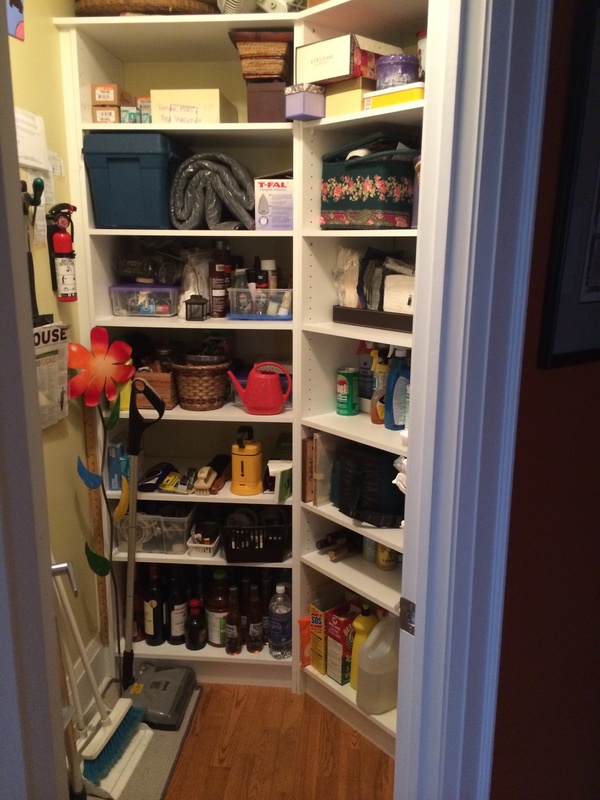 By creating piles and slowly replacing items into the closet we were able to transform an overstuffed utility closet functioning at a low level with a box of Spick and Span spilling on the floor every time you reach for a sponge into a storage dream. Everything is visible – inside of clear bins or boxes cut down… labeled! Floor to ceiling storage. I can’t imagine a more beautiful site! 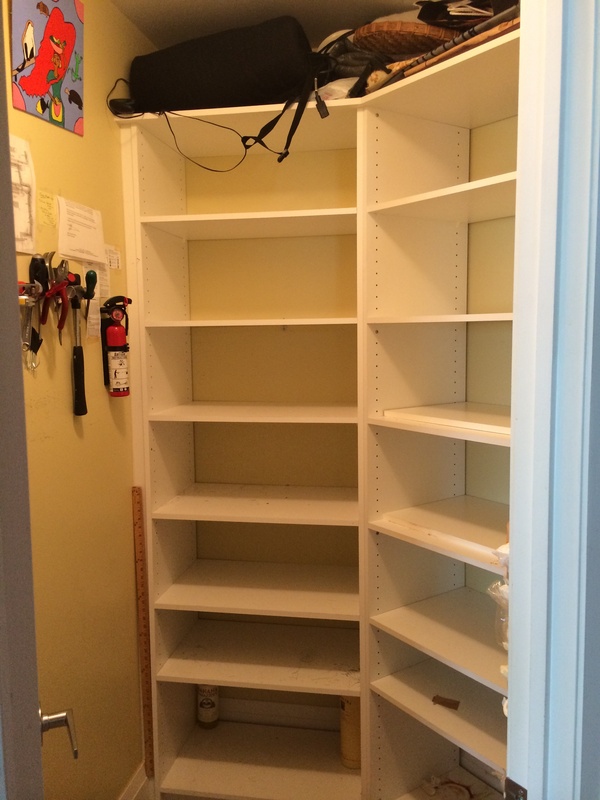 Slowly chipping away at closets and cabinets make a huge difference in our homes. By maximizing storage space you open up space within your home. Things find homes, you become inspired to keep these spaces in their beautifully organized state. Organization breeds organization! Stick with the system: Sort -> Edit -> Reorganize. It works and gives consistently solid results. Don’t be afraid to feel a little over your head. 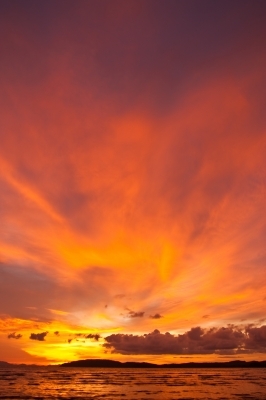 The results are worth the overwhelming moments you experience in the middle, guaranteed! The first step to figuring out WHY your morning digresses into a state of chaos is to figure out what you are doing in the morning. Get out a pad of paper and a pencil or your smart phone. Write down everything you do in your morning routine for the next two weeks. Everything- if you hit the snooze 4 times, write it down, took 15 minutes to pick out an outfit write it down. With this list you can analyze your routine and take out the parts that are holding you back and causing you to be late. I talk about specific examples and ideas for families to get organized in this blog about Back to School Routines. But what you really want to think about is preparing as much as possible the night before. I still lay my clothes out like I did in school. I have my day planned the night before and I go to bed on time, meaning built in time to read and relax before turning out the lights. If you have a problem preparing for the night before set a timer for yourself. Give yourself time to plan for the next day. Pick out your outfit, make your lunch, pack your purse or brief case, make sure your keys are where they need to be etc. When the timer goes off you know it’s time to prepare. Don’t forget to breath in the morning. It sets the tone for the rest of the day so make it happy and positive.